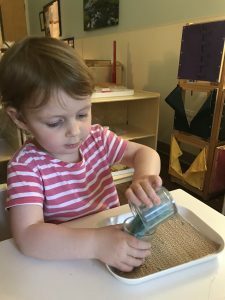 Parents often wonder ‘What is Montessori?’ ‘How is a Montessori school different from a traditional school?’. 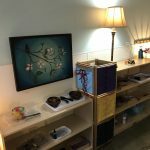 There are many aspects of the Montessori approach and philosophy that make it unique. Over the next several months, we will try to answer questions we hear most often from parents with examples from our teachers and classrooms at Discovery. Through this, we hope you’ll gain a more in depth understanding of this great approach to education and understand why we all love it so much! Let’s start with the classroom itself through this article written by Judi Bertelli. Maria Montessori referred to the classroom as a “prepared environment”. Teachers spend many hours setting up their classroom and continue throughout the school year to evaluate the classroom environment. 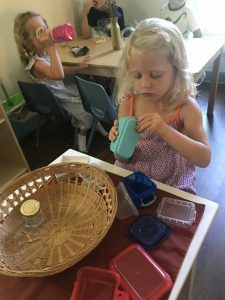 The Montessori approach includes classrooms that allow for independence, movement, children learning at their own pace, intellectual and social development, self-correction, peer teaching, exploration, self-discipline and freedom. When creating the prepared environment the following six components are considered. 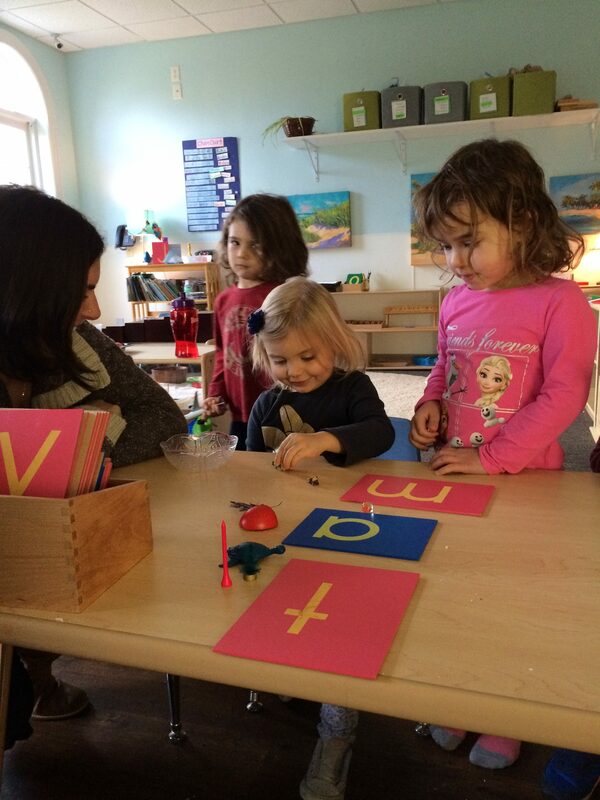 In keeping with the Montessori approach, the classroom is child-centered vs. teacher-centered. Within the confines of the daily routine children have many opportunities to make choices: when to have snack, what lessons to work with, whether to work alone or with a friend, whether to work on the floor or at a table. Children learn by repetition so they are encouraged to repeat a lesson and they can choose how long they want to work on a lesson before moving on to another. Young children need routine and order in their lives. To develop mental and intellectual order, their physical environment must be calm, organized and free of chaos. A new lesson includes showing the child how to put the lesson away so that it is ready for the next person and where it belongs on the shelf. Materials are arranged on the shelves in order of difficulty moving from left-to-right. Classroom changes are kept to a minimum and are carefully planned so as not to disrupt the children’s sense of order and need for routine. Maria Montessori believed that children should experience nature and not be confined to an indoor classroom, therefore live plants and animals should be included in the classroom. Shells, rocks, leaves, nests, etc. can be on display and available for examination. Many of the materials are made out of wood. The furniture is child-sized and children use small spoons, scoops, pitchers, whisks, mops, brooms, etc. so they can do their work with ease and minimal frustration. 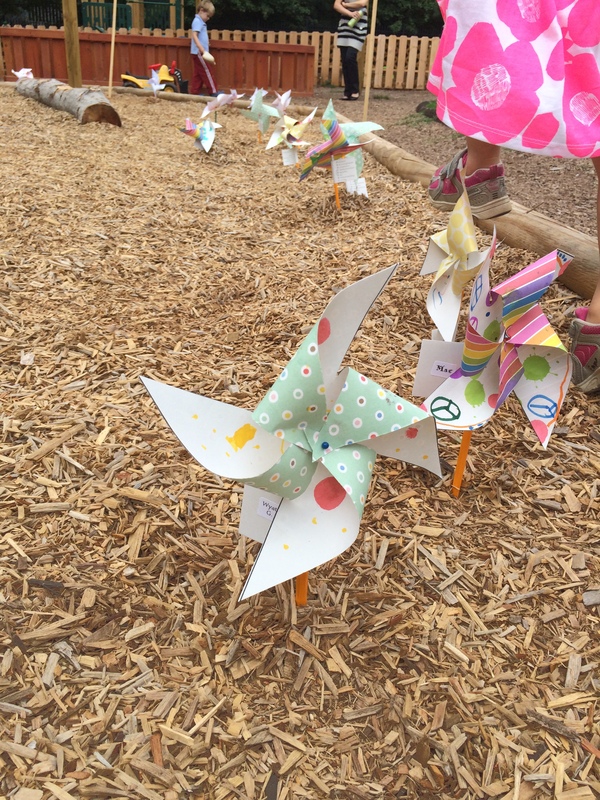 The outdoor environment can be an extension of the classroom, therefore allowing exploration and discovery as well as gross motor development. Children spend many hours in their classroom, thus it should be a place of beauty and harmony. The didactic materials are attractive, well designed and complete with no broken or missing pieces. The vast variety of lessons are arranged on orderly shelves with each lesson belonging in a specific place. Beautiful art can be displayed on uncluttered walls so as not to be over-stimulating. Using controlled body movements and “inside voices”, children are free to move within the classroom and interact with their classmates. Social skills are not innate; they are learned through adult modeling and being part of a community. Good manners, compassion and empathy are modeled and encouraged. The Montessori approach encourages peer teaching which develops naturally due to mixed-age grouping and children learning at their own pace. Freedom of choice should not be misconstrued as complete freedom – it is freedom within limits. Classroom ground rules are established to allow for a safe classroom. Children learn proper social decorum and learn to respect the adults, their classmates and the materials. While most of the work time is spent in individual work, there are times when the class joins together as a group for stories, transitions, music and other activities. This gives children an opportunity to learn how to behave and attend in a group setting. Freedom, structure and order, exposure to nature and beauty in a safe harmonious environment allows for intellectual development. Children are given new lessons and challenges based on their readiness. Age is a guideline but not used to restrict opportunities nor to have age based expectations. 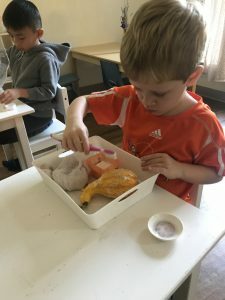 The varied curriculum includes lessons in each of the following areas; practical life (sometimes referred to as everyday living), sensorial, language, math, science, geography and culture, art and music. Lessons are presented from simple to complex, from concrete to abstract so children understand concepts and are not just memorizing information. 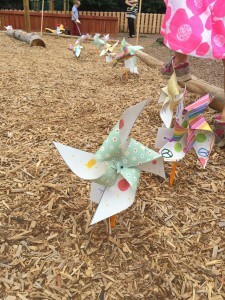 Fine motor skills are developed primarily in the practical life area – the outdoor playground allows for gross motor skill development. 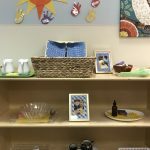 The practical life section of the Montessori classroom is a popular and busy area. The purpose of this part of the curriculum is to allow children to learn and practice skills needed to become independent and to function as a contributing member of their family and society, thus it is sometimes referred to as “everyday living”. Every authentic Montessori classroom world-wide includes practical life lessons. They vary according to the skills children need to learn specific to their culture and environment. Young children want to do things for themselves. 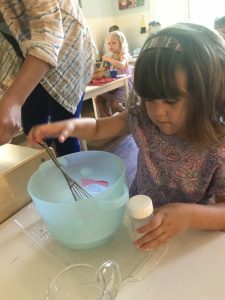 We encourage and expect independence; therefore the curriculum includes opportunities for children to practice skills such as sponging, pouring, sweeping, buttoning, etc. Young children can easily manage the child-sized pitchers, bowls, and utensils. Control of movement is a goal so the skills are demonstrated modeling slow and precise movement which the child then practices until mastered. When one skill is mastered, such as dry pouring beans or rice, they are ready for the next challenge – a water pouring lesson may be next. Skills are at first isolated and then can be combined for more complex activities. For example, a child will practice using a sponge and pouring water and then can combine those skills to learn how to wash a table. Spills are OK – they learn how to sweep and mop too! Practical life work is not just for the younger children. Older children can learn to polish silver, pour through funnels, tie, use tools etc. 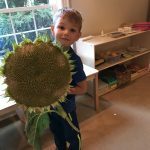 The Elementary Montessori curriculum includes age appropriate practical life lessons to help children become capable and responsible adults. This area is called “practical life” because the children are learning skills that are useful in their world. They want to become independent and to contribute to their family. Adults do a disservice when they do things for children that they are capable of doing themselves. Young children can help with simple household chores such as dusting, making their beds, feeding pets, setting and clearing the table, dressing themselves, etc. They can help with cooking, gardening and yard work. They can and should carry their own lunch boxes, water bottles and other items into school and be responsible for collecting their belongings at the end of the day. Practical life lessons also help develop fine-motor skills, concentration, attention span and attention to detail. This area includes lessons in grace and courtesy as well. Learning how to greet visitors, meet new people, good manners, how to comfort a classmate, respect for one another and for the environment are some of the social skills children learn and practice. All the children enjoy the lessons in practical life, from the youngest who are dry pouring to the oldest children who are learning how to use a hammer. Water work can be very soothing for those needing something calming to focus on. It’s a busy place that the children never outgrow. A child’s language development begins in infancy, long before he joins our program. Our role is to provide a language rich environment and age-appropriate materials that will allow that development to continue and flourish. Our youngest children in the Iris class are just starting to say individual words. Teachers speaking slowly and clearly assist that development. Teachers use correct terms for vocabulary, read stories, use sign language, sing songs, and enjoy finger-play. Some children in our youngest class start to recognize and respond to their name and may start to follow one or two step directions. They may be putting a few words together by the time they move up to the next class level. At around age 2 most children start speaking in short sentences and have a functional language. Teachers in the toddler program continue to model clear spoken language. Children are encouraged to verbalize their needs. Naming actual objects or pictures of objects helps to increase vocabulary. Children build visual discrimination skills through matching objects and pictures and by learning to recognize colors and shapes. Learning to listen is part of language development. Reading to the children, engaging them in conversation and giving them short verbal directions to follow enhance listening skills. The pre-reading lessons in the older toddler class and in the 3-6 classes include more visual discrimination practice. Matching, sorting, classifying, patterning, and go-together cards are used. Rhyming and opposites will be introduced. Vocabulary work is done not only in the language area, but also in the sensorial, science, cultural and geography lessons. Pre-writing work is done with lessons that help children learn the proper way to hold a pencil. Pencil control and fine-motor skills are practiced. Preparation for writing includes sandpaper letters that the children can feel and trace. Our language curriculum in the 3-6 program is phonic based. Children learn letter sounds starting with lower case letters. Once they know 10 or more sounds, they are introduced to a word building lesson called the movable alphabet. They learn that putting sounds together creates a word. Children are often ready for word building before they are able to write so the movable alphabet allows them to “write” without paper and pencil. It isn’t long before they start sounding out 3 letter words. They match words to objects or pictures, increasing their understanding that a word has meaning. 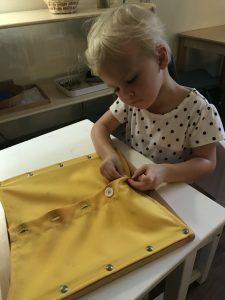 In keeping with the Montessori philosophy of allowing children to progress at their own pace, lessons are presented according to a child’s interest and readiness. When ready, a child will progress to reading short sentences, sight words, and may start reading emergent reading books. Both receptive language skills and expressive language skills are important milestones. As the children get older, they will be given opportunities to follow 3 or 4 step verbal directions. Sustaining attention in a group, answering questions with an appropriate response and staying on topic while carrying on a conversation will be expected. They can listen to longer books and start to retell a story. Older children can be asked to predict an outcome or next event in a story. Vocabulary and expressive language skills increase as children are allowed to converse and interact with adults and peers throughout the day. Show-n-tell is a great way to help children become comfortable speaking in front of a group. Creative writing can start by “writing” stories with the movable alphabet or dictating to a teacher. Using phonetic spelling, some children start writing stories themselves and illustrating them as well. Even after a young child learns to read, it remains important that they continue to be read to daily. At around age 4 or 5, you can start reading chapter books that may take several days to finish. Ask your child what happened previously in the story before continuing from one day to the next. Choose books that don’t have a lot of illustrations, allowing children to create their own images as they listen to the narrative. Include poetry, fiction and non-fiction on your child’s bookshelf. Have multi-cultural books and books that include characters in non-traditional gender roles, for example a male nurse or a female fire fighter. Biographies of famous people are popular with young children. Be prepared to read the same story numerous times – children love the repetition. Change the wording in a sentence or the ending of a story to add a new challenge as the child listens for those “mistakes”. 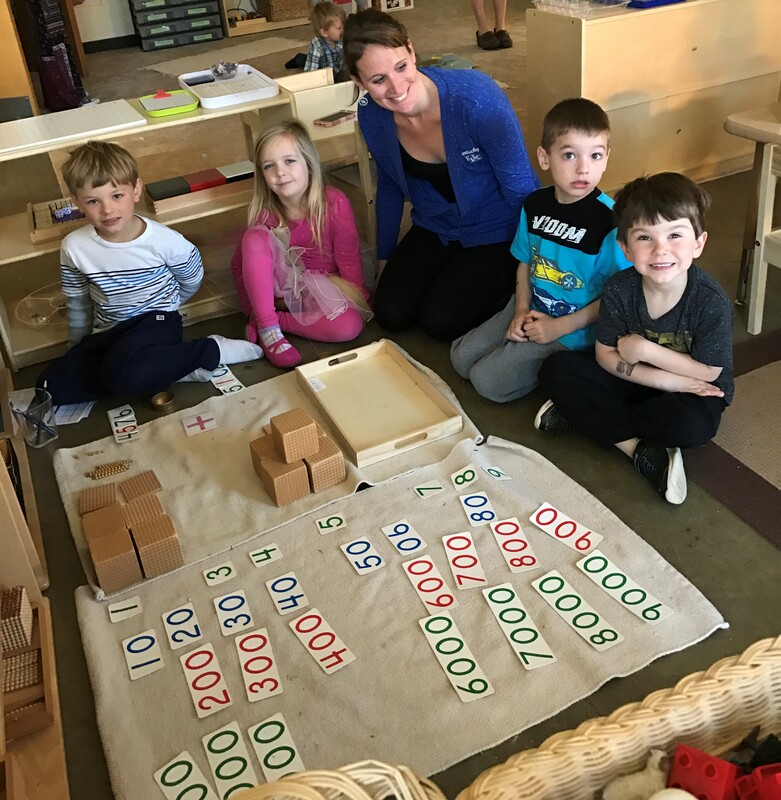 Math concepts are made fun and simple in the Montessori curriculum so that math is an exciting discovery, not a subject to be learned. Using manipulatives, the math lessons begin with a very concrete experience that later leads to abstraction. Many young children learn to count at an early age but without the understanding of what numbers mean. As our students count they also practice one-to-one correspondence, learning that a number represents a quantity. They then use the sandpaper numbers to learn numeric symbols, 0-9, and finally they combine quantity and symbol. We have a lesson dedicated to teaching the concept of “0”; the children place the correct number of spindles into a box labeled 0-9 and then discover that the “0” section remains empty because “0 means nothing.” Children experience the concept of odd and even by using numbers and counters. All the counters under the even numbers have a partner; the last counter under the odd numbers is left without a partner. Once 0-9 are mastered, they move on to the teens and the tens. The teens board combines the 10 bar with the 1 bead to make “11”, the 10 bar with the 2 bead to make “12” etc. The tens board puts two 10 bars together to make “20”, three ten bars combine to make “30” etc. Adding units, they make “34” or “67” or “92”……… Repetition with these boards leads to an understanding of teens and tens. 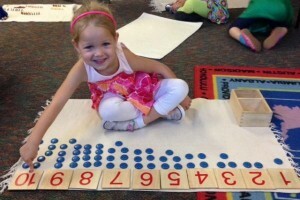 Using the 100 board, they learn number recognition and number sequencing. Skip counting is fun using the linear chains to count by 2s, 3s, 4s, etc. Older children start building big numbers with the “golden beads” that teach the decimal system. They can feel the weight difference as they carry a tray across the room that includes 1000 cubes and 100 squares vs. units and tens. Using the decimal system cards, they discover that a “1” has no zeros, “10” has one zero, “100” has two zeros and “1000” has three zeros. The concepts of addition, multiplication, subtraction and division are learned, again using hands-on manipulatives. Once the concepts are understood, the math facts are practiced with a variety of lessons. The older children learn money, time and measurement. The math curriculum in the 3-6 class builds the foundation for later learning and takes the fear of math out of the equation. Math isn’t taught – it is joyfully discovered. The Montessori Services website has a great article about Montessori math.